They still have some of the important players from eight years ago and a fresh group of hungry superstars ready for their first World Cup. Now adidas hook them all up with their World Cup shirt, which you can get closer to here. First Germany stole their World Cup title and last year Portugal took over as reigning European Champions. Spain are still very much a force to be reckoned with and will go into the 2018 World Cup in Russia expecting to go very far if not all the way. Today, along with all the other adidas WC18 shirts, Spain have been presented with their new shirt. 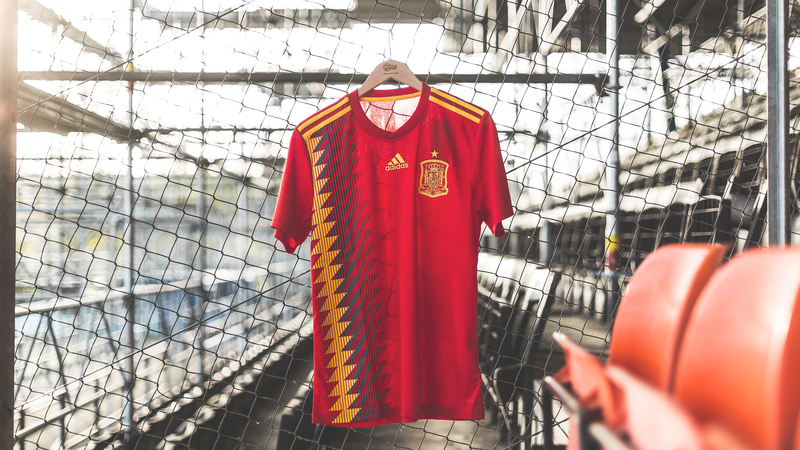 The World Cup 2018 Spain shirt features an almost retro design, which is still absolutely bursting with energy. It pays tribute to one of the country’s most famous shirts, which is the shirt they wore at USA ‘94. The similarities are there to be seen, with the dynamic diamond graphic running down the side of both shirts. This vibrant diamond design is made to represent the speed, energy and tiki taka style of play that everyone associates with them. You can order your Spain shirt for the 2018 World Cup right here on unisportstore.com. It is available right now. There have been lots of other World Cup 2018 shirts launched today. Read more about Argentina, Belgium, Germany by clicking the name.